As seen on DIY Del Ray! More than any other holiday Thanksgiving revolves around the table. Every host wants a beautiful table that invites guests to a good time. But with cooking the turkey, cleaning the house, dressing the kids, or even running a Turkey Trot (I’m running my first this year! ), the table can easily become a last minute rush to get it set and not forget the spoons. So how can you bring the table into your Thanksgiving preparation without adding more to your already bulging To Do list? I’ve got some easy tips that make your table almost as memorable as your food. These are some of my best ideas for a great Thanksgiving table. It’s an easy plan for a great party. This table is set for six, but feel free to enlarge or reduce the items depending on the size of your crowd or dining room. You can do all of this setup two to three days in advance so you’re not worrying about it at the last minute. There are two points to remember during the planning of the table. First – don’t crowd. Thanksgiving is all about the food and there will be more than usual on the table. It’s important to keep this in mind so your cranberry sauce doesn’t get knocked on the floor or someone’s lap. 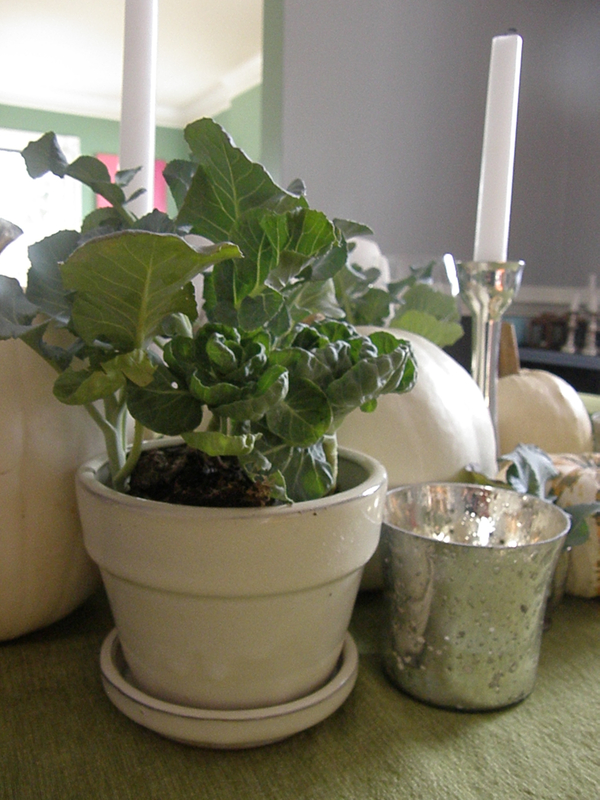 Second – keep all table decorations either above or below eye level. This will help with conversation and doesn’t block the view of any of your guests. In the home setting lower is better unless you want to set a ceiling fixture on fire. Fire and Thanksgiving do not mix unless you’re barbecuing a turkey! Here is a step-by-step guide for a unique and hassle free table that will have your guests impressed almost as much as your tasty turkey. First start with the largest items. This Thanksgiving I skipped orange overload and went with a modern white and green palate. 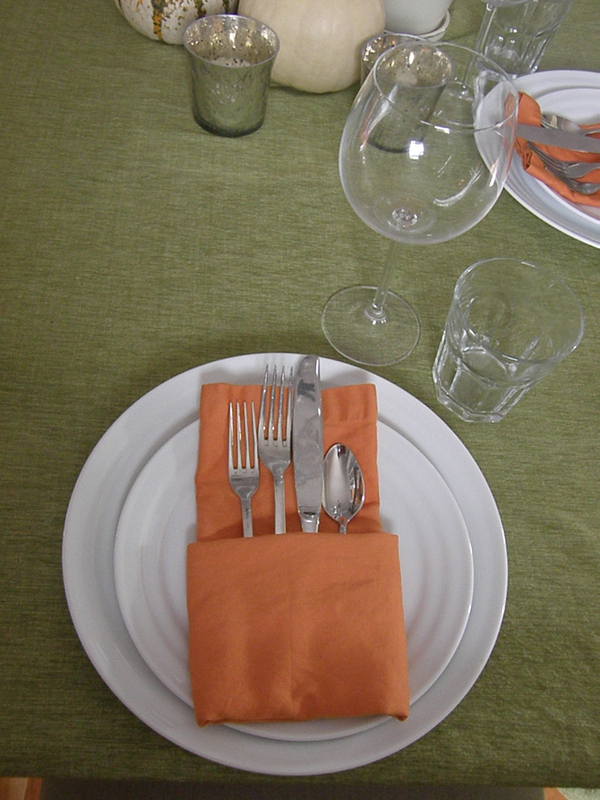 The nod to traditional Thanksgiving comes with orange accents in the napkins and gourds. 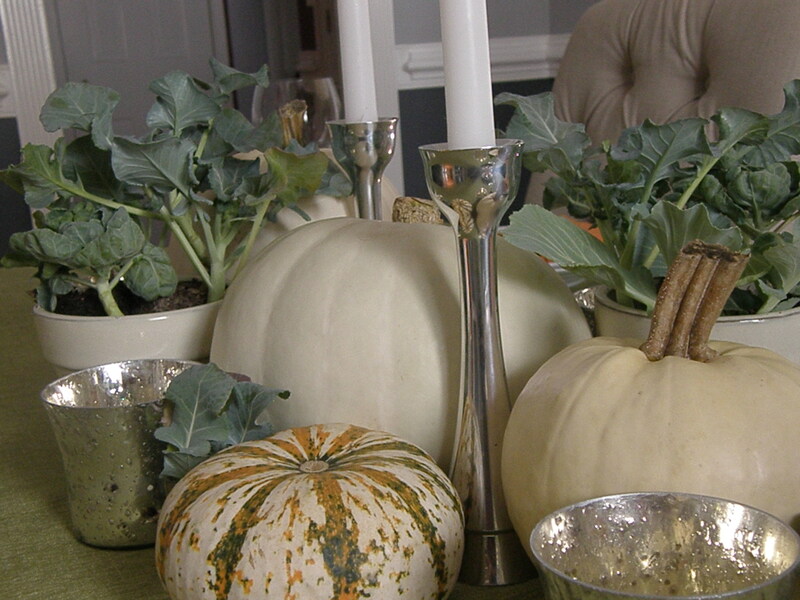 I started with a green tablecloth and three white pumpkins in varying sizes to anchor the table. Next add the lower level of pumpkins. I find it easiest to work with the larger items then moving to smaller items. That way you can adjust as you go and fill in spaces as needed. I used two gourds with orange accents to add color and interest. Opposite ends of the pumpkin line keep it balanced with out getting too formal. Now add the greenery. I used broccoli and brussel sprout seedlings connecting to the dinner as a whole and brings farm to table to a whole new level. The plants, pumpkins and pots are all from Greenstreet Gardens. 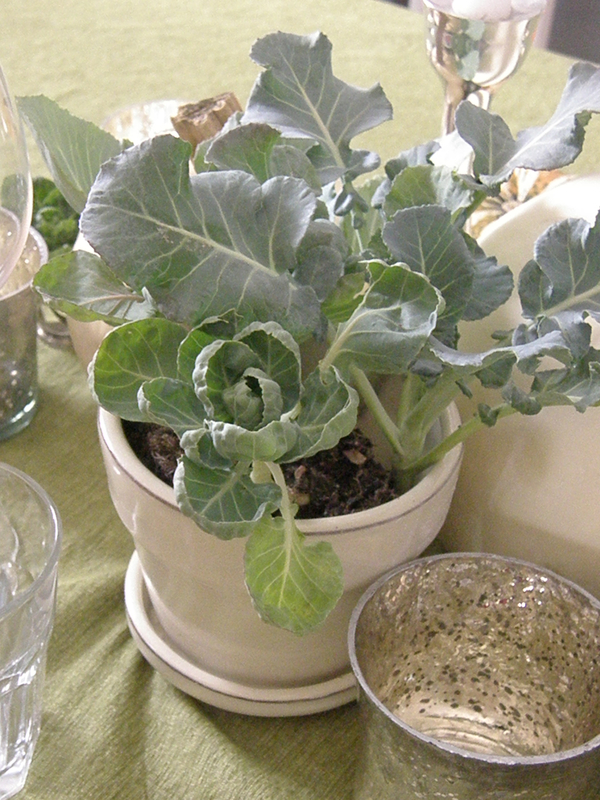 I like using plants so you can either hand them out as favors or plant them in your garden. Hopefully you have a better green thumb than I do. If flowers are more your style, white roses, hydrangea, mini calla lilies or even tulips are good options. Just make sure to cut the stems short enough. It’s wonderful to add old in with the new to give your table a unique feel. 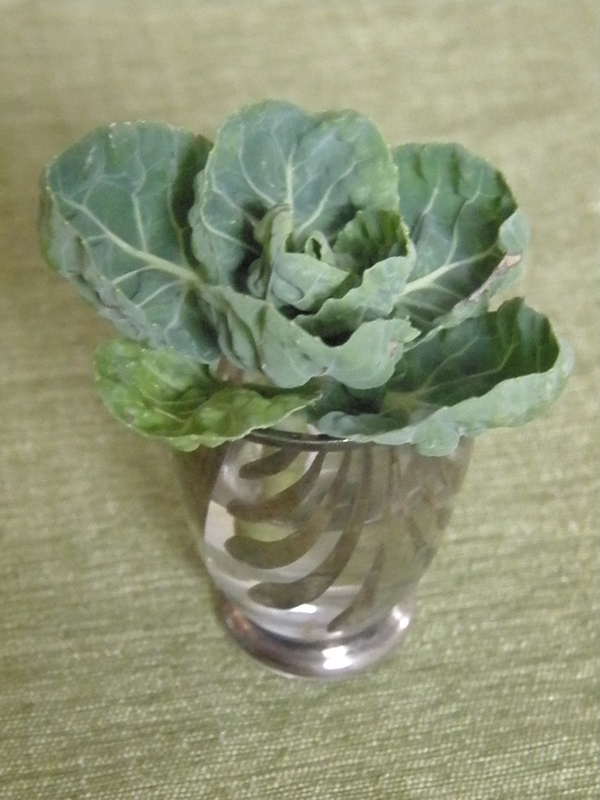 I added small cuts of the greens in vintage cordial glasses. The glasses came from my husband’s grandma. And the lower greenery gives even more dimension to the arrangement. Lastly the candles are added. Using a combination of votive and taper candles allows for maximum glow. And everyone looks best in candlelight! For this size table two tapers and six votives are perfect. I used votives in mercury glass to tie in with the cordial glasses. You could also use mini pumpkins as candle holders. Next on to the place setting. I’m a fan of using casual dinnerware, but if you love your china this is a great time to break it out. The menu fold for the napkins is my favorite but you can find all sorts online. I’m planning on serving a salad first so I included a salad plate and fork, but if you’re saving space for more stuffing remove them. For glassware a short water glass and a tall wine glass brings the whole thing together. In the end Thanksgiving is about food, friends and family. Keep these tips in mind and you’ll be set for a wonderful dinner with them. Happy Thanksgiving!